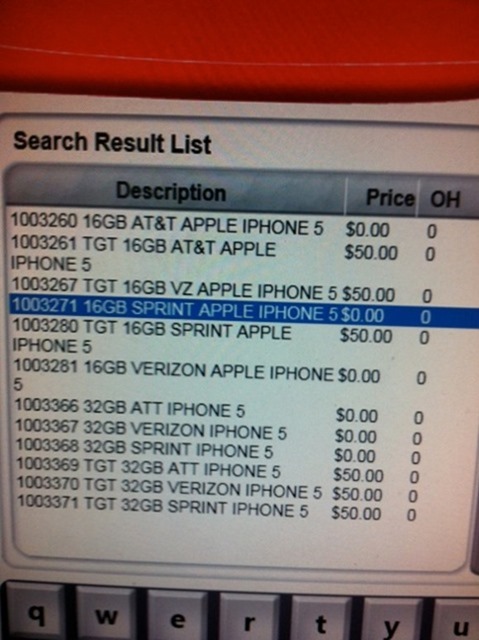 A photo of Radio Shack’s internal inventory system has emerged today which shows a Sprint iPhone 5 listed which suggests exactly what you think. The news comes from 9to5Mac – a blog dedicated to covering all things Apple – in a picture which, as we mentioned in the first paragraph, shows a model named 1003271 16GB SPRINT APPLE IPHONE 5 and 1003371 32GB SPRINT IPHONE 5 in Radio Shacks inventory system. If you thought Apple officially announcing the iPhone 5 Media Event would spell the end of iPhone 5-related rumors and reports, then I’m afraid you’ll have to wait a little longer. These reports just keep on coming in! Rumors of Apple launching their iPhone on networks other than AT&T have existed since 2007. Reports about Verizon carrying the iPhone only ended when Apple officially announced that a CDMA model of the iPhone 4 would be coming to said network. That leaves two major wireless networks in the US which don’t carry an iPhone: T-Mobile, and Sprint. All sorts of reports regarding Sprint and iPhone 5 have been published by different outlets and, subsequently, covered here at Redmond Pie. I’ll talk about a couple in the succeeding paragraphs. One of this year’s earliest report came from popular daily newspaper Wall Street Journal which cited people “familiar with the matter” who claimed that the next iPhone would be carried by Sprint. The second came from This is my next – a blog dedicated to covering consumer electronics – which showed authentic-looking photos of internal memos, fixtures and meeting schedules which, well, suggested that the iPhone 5 would be coming to Sprint in October (i.e. this month!). Another one came from Bloomberg which stated that the iPhone 5 would come to Sprint with unlimited data – something which competing networks like AT&T and Verizon do not offer. And lastly, let’s not forget the photo of an internal memo which suggested that Sprint would not allow employees to take vacations between September 30th and October 15th. T-Mobile won’t get getting an iPhone 5 this year, though, as confirmed from the company’s CMO. The keywords here are iPhone 5 (he didn’t anything about the 4S now, did he?) and “this year”. So, who knows! T-Mobile might get an iPhone next year! Apple will be holding a media event on Tuesday, October 4th where they are expected to announce the next iPhone. Stay tuned!